Waterrock Knob is a must-stop along the Blue Ridge Parkway. Located at Milepost 451.2, it features the last hiking trail along the Parkway as you travel toward the Great Smoky Mountains National Park. 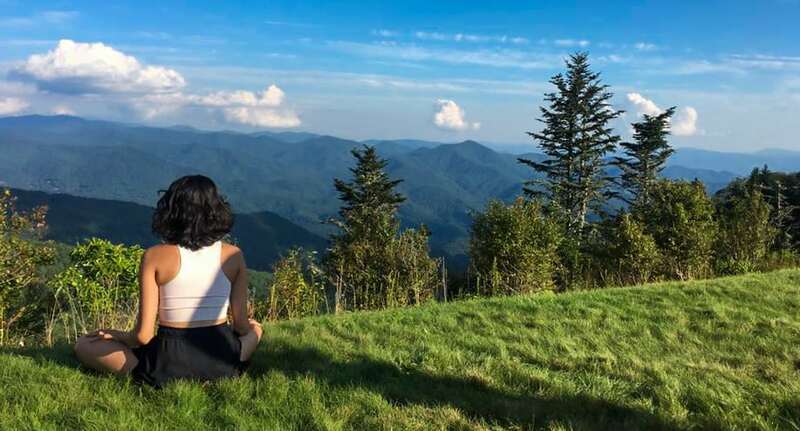 This peak (6,292 feet) is the 16th highest mountain in the Eastern United States and the the 15th highest of the 40 mountains in North Carolina over 6,000 feet. The hiking trail also leads to a plane crash site and Mount Lynn Lowry if you choose to hike farther. And if you don’t feel like hiking, there are fantastic views both east and west from the “mile high” parking area complete with picnic tables to soak in the views. The parking lot is also home to a Visitor Center and restrooms. This is one of the best places in the North Carolina mountains to watch a sunrise or sunset. If you do feel like hiking you will be rewarded with views like the one above. Out and back hike to the summit gains 412′ in elevation. The first 1/4 of the trail is paved ending at an overlook and then the trail turns to dirt. On a clear day you can have 50 mil views from the summit of Waterrock Knob. A trail to the left right before the summit will take you a plane crash site and on to Browning Knob and Mount Lynn Lowry. From Maggie Valley head South on US 19 towards Cherokee to take a right on the Blue Ridge Parkway entrance ramp and another right at the stop sign. The turn for Waterrock Knob will be on your left with signs to the parking lot.